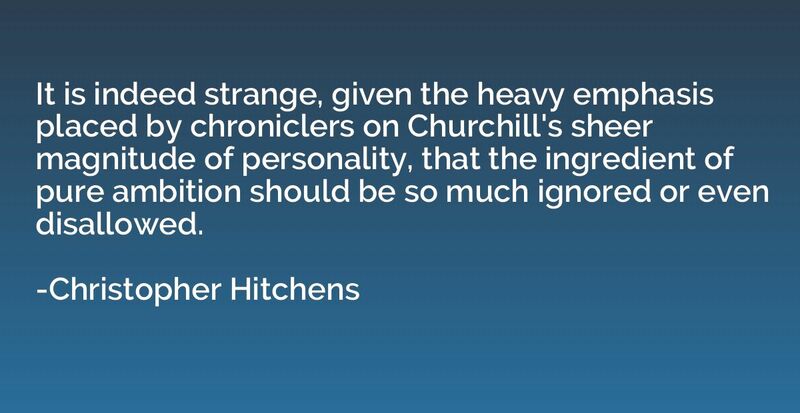 It is indeed strange, given the heavy emphasis placed by chroniclers on Churchill's sheer magnitude of personality, that the ingredient of pure ambition should be so much ignored or even disallowed. Wars, wars, wars': reading up on the region I came across one moment when quintessential Englishness had in fact intersected with this darkling plain. In 1906 Winston Churchill, then the minister responsible for British colonies, had been honored by an invitation from Kaiser Wilhelm II to attend the annual maneuvers of the Imperial German Army, held at Breslau. 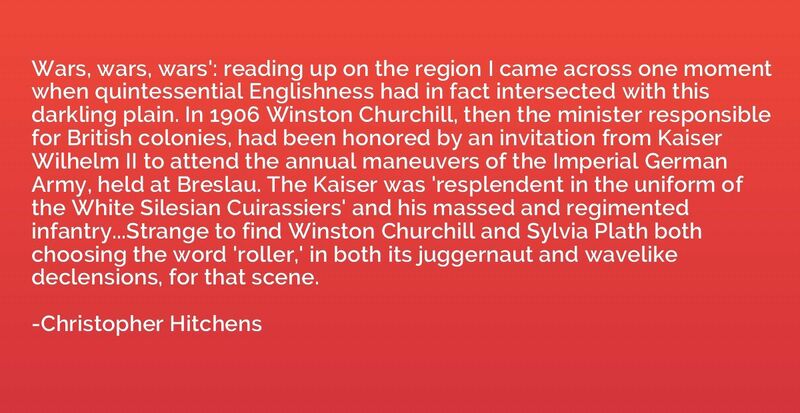 The Kaiser was 'resplendent in the uniform of the White Silesian Cuirassiers' and his massed and regimented infantry...Strange to find Winston Churchill and Sylvia Plath both choosing the word 'roller,' in both its juggernaut and wavelike declensions, for that scene. 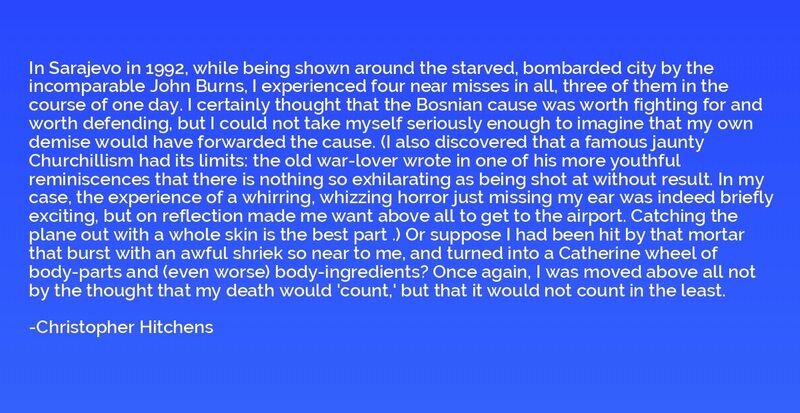 In Sarajevo in 1992, while being shown around the starved, bombarded city by the incomparable John Burns, I experienced four near misses in all, three of them in the course of one day. I certainly thought that the Bosnian cause was worth fighting for and worth defending, but I could not take myself seriously enough to imagine that my own demise would have forwarded the cause. (I also discovered that a famous jaunty Churchillism had its limits: the old war-lover wrote in one of his more youthful reminiscences that there is nothing so exhilarating as being shot at without result. 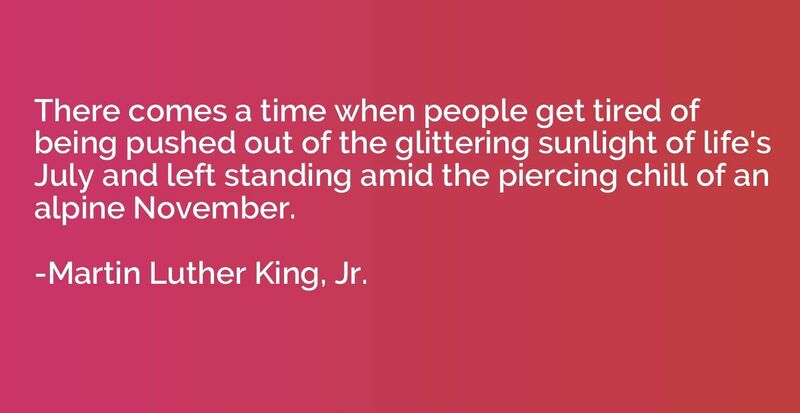 In my case, the experience of a whirring, whizzing horror just missing my ear was indeed briefly exciting, but on reflection made me want above all to get to the airport. Catching the plane out with a whole skin is the best part .) Or suppose I had been hit by that mortar that burst with an awful shriek so near to me, and turned into a Catherine wheel of body-parts and (even worse) body-ingredients? Once again, I was moved above all not by the thought that my death would 'count,' but that it would not count in the least.